The Government of Pakistan announced the death of “General His Highness Nawab Al Haj Sir Sadiq Muhammad Khan V Abbasi, N.Q.A, G.C.S.I., G.C.I.E., K.C.S.I., K.C.V.O., L.L.D., the Ameer of Bahawalpur at 1.45pm on May 24, 1966, at London… His Highness was a great patriot…” In Pakistan, the national flag was lowered to half-mast on public buildings.In London, the representatives of the Queen condoled following funeral prayers. At Karachi airport, the General Officer Commanding, Pakistan Army, received the body of the late ruler on behalf of the President of Pakistan. Units of the Pakistan Army presented an Honour Guard as six pallbearers from the Army bore the late ruler’s coffin draped in the national flag. A special train escorted by an Honour Guard transported the coffin, members of his family and household staff to Bahawalpur. On the following morning, the railway lines in the former Bahawalpur State were blocked by people mile after mile. Immense crowds expressed grief at the loss of their former sovereign who had succeeded to the throne of Bahawalpur State in 1904. He represented almost three centuries of peace, dignity and benevolent rule. At Sadiqgarh Palace, the coffin was mounted on a gun-carriage escorted by six generals of the Pakistan Army; the procession followed on foot for one kilometre through silent crowds. Thereafter, the procession entered vehicles bound for Fort Derawer in the Cholistan desert to bury the last of Bahawalpur’s rulers alongside his ancestors. At Fort Derawer six buglers of the Pakistan Army sounded the Last Post. Artillery batteries of the Pakistan Army, coordinated by radio, fired a 17-gun salute simultaneously from Rawalpindi and Fort Derawer. Thus the history of Bahawalpur State was buried. The territories of Bahawalpur State comprised an area larger than Denmark or Belgium, its ruler was entitled to a return visit from the Viceroy of India. On August 14, 1947, its eastern border across ‘the Great Indian Desert’ was shared with India for 300 miles. Its western border was the River Indus, while its northern border was the River Sutlej shared with Punjab, and its southern border was shared with Sindh. By 1947, Bahawalpur State’s institutions, largely set up by successive British advisors with support from the rulers, consisted of departments run by trained civil servants; there was a Ministerial Cabinet headed by a Prime Minister; the State Bank was the Bank of Bahawalpur with branches outside the State also, including Karachi; there was a high court and lower courts; a trained police force and an army commanded by officers trained at the Royal Indian Military Academy at Dehra Doon. Regiments of the State’s Forces were later to become distinguished regiments of the Pakistan Army such as the 8th Baluch (1st Bahawalpur Light infantry), the 9th Baluch (2nd Bahawalpur Light Infantry), the 20th Baluch, the 21st Baluch, the 14th Abbasia Field Regiment Artillery, etc. Education was of special interest to the late ruler. A network of primary and high schools, colleges and a university called Jamia Abbasia (now the Islamic University of Bahawalpur) were operative in the state. Education was free to A level and the State’s Government provided scholarships of merit for higher education. In 1951, the late ruler donated 500 acres in Bahawalpur city for the construction of Sadiq Public School. It was to be the last large education institution to be built in his lifetime. This institution produced politicians, a chairman of the Senate, businessmen of today’s Pakistan, and several corps commanders. Libraries existed in every tehsil and a most impressive central library (the Sadiq Reading Room) at Bahawalpur was inaugurated in 1924 by Sir Rufus Daniel, Governor General of India. A well-stocked zoo was established in the city as also was the Bahawal Victoria Hospital. The Boundary Commission formed for partition of India and chaired by Sir Cyril Radcliff allocated the territories to comprise the Dominions of Pakistan and India. The Award excluded the territories of Bahawalpur State from Pakistan since they were not part of British India. Correspondence from the 1930s between Allama Iqbal and the late ruler shows his interest and support for the Muslim struggle for a homeland, with ongoing financial support for the Muslim League. A relationship of many years developed between the late ruler and the Quaid-i-Azam, who was also engaged professionally for a period to advise. It was this relationship that was later to become significant, politically and economically, in the strengthening of Pakistan. While India inherited Delhi, the imperial capital, Pakistan had Karachi, then a small town with virtually no State apparatus, without stationery in offices and no State Bank. Financial funding for the new dominion and facilitation of the Quaid to operate as Head of State and the running of administration was much needed. For the inauguration of the Quaid as Governor General of Pakistan in the presence of the Viceroy, Lord Mountbatten, on August 14, 1947, the late ruler dispatched units of Bahawalpur’s State Forces to Karachi to provide an Honour Guard on the occasion. A Rolls Royce open Landau was also dispatched for the Quaid to receive Lord Mountbatten and proceed through Karachi to Government House. Bahawalpur State was independent of Pakistan. The India Act of 1935 provided that the future status of the State lay with its ruler. For Pakistan securing the eastern border with India and for ensuring the passage of water from the rivers Sutlej and Indus was critical (an elaborate and modern irrigation system was in place); all the new Dominion’s lines of communication from north to south ran through Bahawalpur State. Consequently, the State became politically central to the survival of Pakistan in 1947. At a meeting with the late ruler at Bahawalpur House, on his private estate at Malir, Karachi, a formal request from Quaid-i-Azam was made to politically federate Bahawalpur State with Pakistan in order to secure its eastern border. It was unhesitatingly accepted by the late ruler of Bahawalpur. Dominion of Pakistan, was drawn out by the late ruler and signed by him and the Quaid. Under the terms of the India Act it was open for the ruler to limit the exercise of federal authority in the State. In the period between October 10, 1947, and September 11, 1948, the initial financial requirements of the new Dominion of Pakistan were settled by the late Ruler (Bahawalpur State to Region, by Dr Umbreen Javaid). Pakistan had no State Bank at the time so the Bank of Bahawalpur became the conduit. Its financial assistance to Pakistan was treated as a contribution, not a loan. Offers by the Dominion Government to compensate the late ruler for the loss of his palaces in Delhi, Missouri and Simla were declined by the ruler. The Dominion Government of Pakistan conferred the honorary rank of Full General of Pakistan Army on the late ruler. It was to be the first of the honours the Dominion accorded him during his lifetime. Following the Instrument of Accession, in 1952, a Second Supplementary Instrument of Accession was drawn up by the late ruler at the request of Governor General Khawaja Nazmuddin for additional “Dominion Subjects” to be approved. This followed the Government of Bahawalpur Act 1952 that created an interim constitution promulgated by the ruler for his State to ensure that elections took place and altered his political position to that of a constitutional ruler. In the same year, the late ruler was invited by the Governor General of Pakistan to pay an unprecedented three-day State visit. 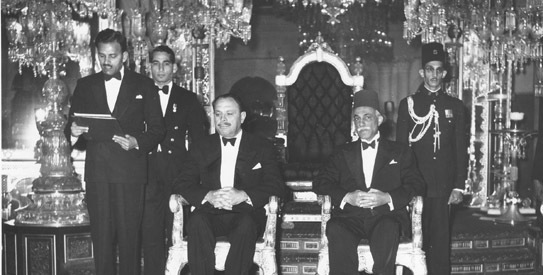 In 1955, it became expedient for the political unity of the Dominion for a merger to take place between the two States which the late ruler agreed to. Accordingly, a Merger Agreement was signed by the late ruler and the Governor General which dealt with the new political position of the Bahawalpur State and the status of the late ruler and his family, which the new Dominion guaranteed to maintain and respect. Withdrawing to private life, the late ruler alternated between Bahawalpur and England where he had maintained his country home on Lord Cowrdry’s Estate since the 1920s and his London residence at White Hall. He maintained his secretariat in London and continued his engagements, as also with Buckingham Palace. In 1959, the late ruler set up his charitable foundation. It was to consist of 1,700 acres to maintain charitable institutions, orphanages and mosques. This followed the grants going to educational institutions, such as endowments to the universities of Aligarh and Punjab, both of which honoured him with degrees of Doctorate of Law. In Lahore, he constructed and donated the Senate Hall of the Punjab University and at Aitchison College the swimming pool, a mosque, and an entire block called Bahawalpur House. 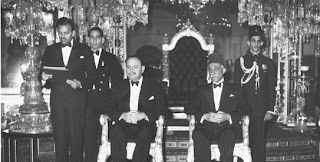 In 1959, President Ayub Khan visited Sadiqgarh Palace and in the Darbar Hall, in the presence of the officials of the Government of Pakistan and the Court, invested the late ruler with the Order of the Nishan-i-Quaid-i-Azam. It was to be the last honour the country could confer on him in his lifetime. In 1965, war with India broke out. The late ruler, by now ailing, contributed extensively to the Defence of Pakistan Fund and also dispatched those regular units of the former Bahawalpur State Force that were retained by him to confront Indian aggression. This gesture for Pakistan was recorded by the Government of Pakistan in its Gazette Notification. It was to be his last gesture for the wellbeing of Pakistan for on May 24, 1966, he died. With the death of the late Ruler, successive governments in Pakistan seem to have forgotten him and the enormity of his contribution to the formation of this country. Gestures such as commemorating his death anniversary are overlooked except at Bahawalpur. Even his name is not cited in the annual Roll Call of distinguished Pakistanis on August 14.